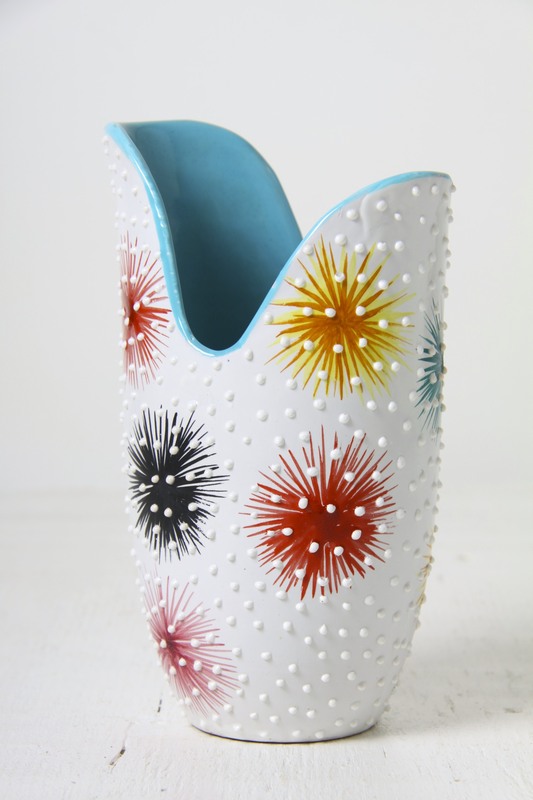 This is a beautiful vase made by Volpi Deruta, Italy circa mid 1950’s. A great rare and unusual piece from Maiolica Derutese Volpi, showcasing Serafino Volpi’s adventurous forms and decors. Stunning form, so reminiscent of the era with its asymmetric, curving bud-like form inspired by nature. The decor is superb, on a glossy white base are raised white dots, labour-intensively hand applied with a pump. 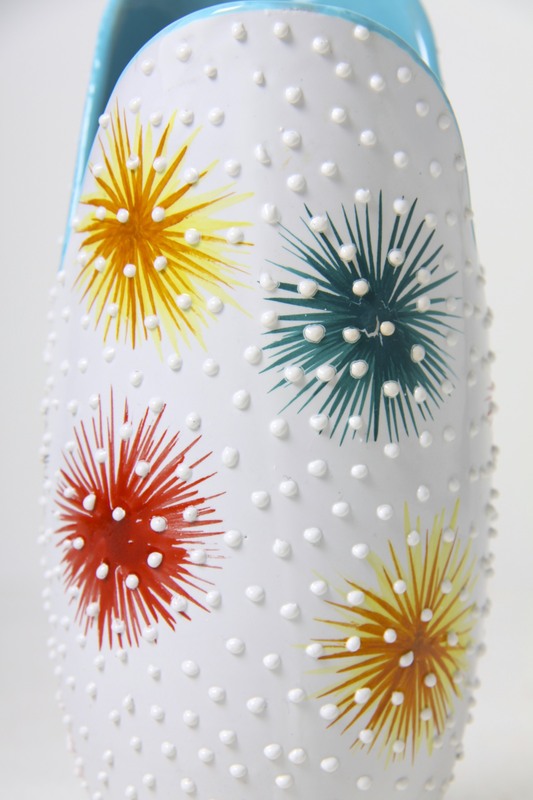 These lay all over on top of bright multicoloured hand-painted starburst motifs. The interior contrasts eye poppingly with a bright glossy blue glaze! Would make a fantastic addition to any collection of Italian, studio, European art pottery, and would complement any retro, vintage, 1950’s, mid century, kitsch or contemporary interior. 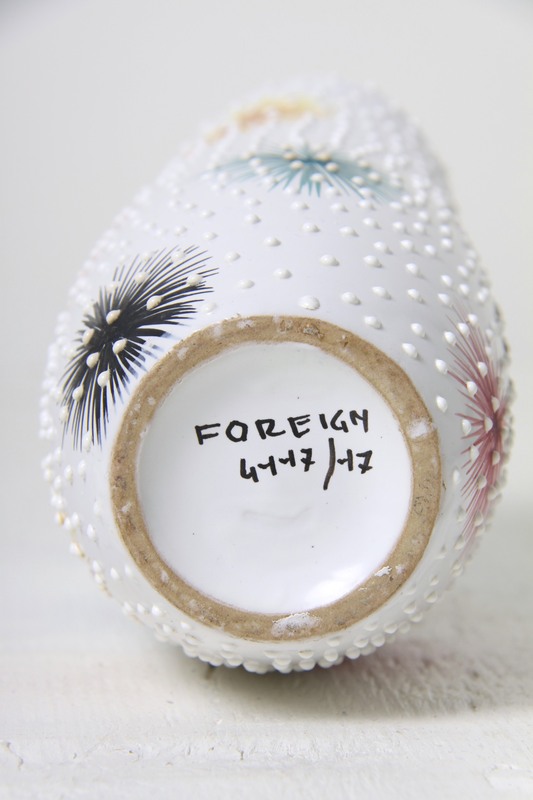 Hand marked to the base ‘Foreign 4117/17’. In excellent condition, no marks, chips or scratches, a couple of tiny burst bubbles in the glaze from production, nothing to detract on display. Measures 17 x 10 x 8cm / 7 x 4 x 3.25in.